An attempt by fighters from the Derna Mujahedeen Shoura Council (DMSC) to break through the Libyan National Army (LNA)’s blockade of the town ended in failure this morning and appears to have given the LNA the chance to take the Kasarat area in the eastern part. The move came as the head of the LNA’s Omar Mukhtar Operations Room tasked with taking Derna, Brigadier Salem Rifadi, declared that there would now be a total blockade. No food, medicines, cooking gas, petrol or anything else would be allowed in. 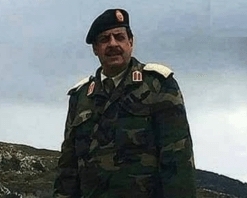 His decision follows the news that one of two pilots shot down over the town yesterday by the DMSC, Colonel Adel Jehani, had died, apparently executed. There have, however, still been no details as to how in fact Jehani died. The DMSC offensive started at dawn today with muhajideen forces attacking LNA positions around the town. It led to the death of five LNA soldiers. Another four were injured, sources in Derna said. For its part, the DMSC says it lost one man. However, in a counter offensive during the day, the LNA are reported to have taken the Kasarat area in east Derna. Sources close to the LNA say that they are now preparing a “massive” attack on the town from east, west and south. The LNA had already been mounting a blockade, although it was not wholly effective. People were able to get in and out. Rifadi told a Tobruk radio station today that that would all now end and that the siege would be total. Nothing would get in or out. Ironically, he was injured in a car crash later today on the road between Tamimi, south-east of Derna, and Marj. He is reported to have suffered a broken leg and was taken to the hospital in Beida for treatment. Two guards travelling with him are said to have suffered minor injuries but are otherwise in good health.